« Willa Cather reading week roundup, and giveaway results. So here we are, it’s almost Christmas and I have finished reading the final book in Anthony Powell’s twelve novel sequence; Dance to the Music of Time, which I had challenged myself to read during 2014. It is approximately ten years since we last saw Nick Jenkins, Lord Widmerpool et al, and as Hearing Secret Harmonies opens there is a very definite seventies feel to the world we find ourselves in. I was almost immediately reminded of Iris Murdoch’s novel Message to the Planet. As the novel opens, Nick and his wife Isobel are playing host to their niece Fiona Cutts and her friends, having agreed to allow the temporary parking of a caravan on their land. Fiona has joined up with a rather peculiar group, a hippy kind of cult by all accounts led by charismatic Scorpio Murtlock. The group; Murtlock, Barnabas Henderson, Rusty and Fiona are taken crayfish fishing by the Jenkins’ and learn something about the mysterious Devil’s Fingers standing stones nearby, in which Murtlock seems to take particular interest. Nick finds other members of the family know all about Fiona and Murtlock, and waste no time in filling him in on the gossip. Watching the news Nick discovers Widmerpool has been appointed chancellor of a new university, where he is pelted with paint by Amanda and Belinda; the twin daughters of JG Quiggin and Ada Leintwardine. This oddly enough leads to a strange kind of association between Widmerpool and the twins, which is memorably demonstrated at a literary dinner – to which Widmerpool has been invited, the dinner is to present the Donners Memorial Prize for biography. The prize has been awarded to Russell Gwinnett for his book about X Trapnel, who was once the lover of Widmerpool’s deceased wife. Widmerpool has been the most extraordinary larger than life character, and for most of this series he has been a rather awful, practically malevolent figure. However here in the winter of his life, he becomes rather ludicrous – so much so I began to question whether or not his descent into peculiar obsession with the counter-culture group led by Murtlock, was actually not rather out of character. Widmerpool’s behaviour becomes more and more erratic; he takes to signing himself Ken Widmerpool and insisting that people drop his title Lord. Widmerpool embraces the very peculiar sounding rites that Murtlock’s cult has adopted and is now more likely to be found running naked through the woods at four in the morning, than in the House of Lords. At Sebastian Cutts’ wedding Fiona turns up newly married to Russell Gwinett, and Nick discovers that the bride’s grandfather was at school with him and Widmerpool, a few years older, and that it was Widmerpool who had been responsible for getting him expelled. As the reception gets underway with guests galore from Nick’s past including Flavia Wisebite, Bob Duport his daughter Polly and former wife Jean Flores (who Nick once loved in his long ago youth) – Widmerpool turns up, bizarrely leading the Murtlock group in a run. Widmerpool decides he wants to take the opportunity to make amends to Sir Bertram Ackworth for the part he played in his expulsion fifty years earlier. Nick is astounded to discover Bithel – whom he and Widmerpool knew during the war – to be a part of this cult, and quite a devoted follower it seems. Powell packs a lot in to this last novel, and in the final chapter there is a feeling of looking back and of things slowing down and coming to a natural conclusion. Just as the first book starts with images of workmen and bonfires recalling scenes from Poussin’s painting, so this one ends with similar images. I feel as if I have rather rushed through this review, not quite knowing which bits to talk about and what to leave out. This novel feels really rather different to many of the books that came before, as I said at the beginning I think it’s a little more Murdoch than Powell in many ways. Certainly Powell has allowed the times in which he was living to creep into the narrative maybe that helps the feeling of time having moved on, the dance continuing for the next generation. Thinking about the entire ‘Dance’, it has been a brilliant reading experience. True, Powell is not easy, there have been moments of ambiguity along the way, paragraphs of real complexity – however, the whole is just an astonishing work. The novels span fifty years, and were written by Powell over a twenty year period, they capture a section of British society during peacetime and war and times of social change. I am so very glad that I read ‘Dance’ – many of the people and images from these novels will stay with me for some time. 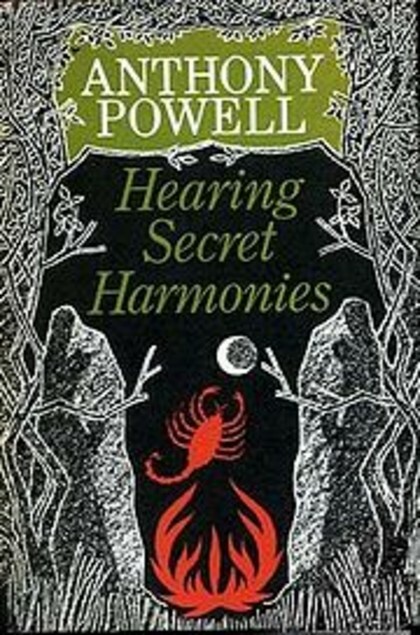 I would definitely recommend this to anyone looking for a reading challenge it fits perfectly into a year, and Powell’s writing is simply brilliant. Thank you 🙂 I really hope you do. I am ready for the Forsyte Saga. Got three big thick volumes sitting here waiting. You have done well, finishing the series and finding things to say about every book. I’ve located my copies and I’ll definitely read them again one day. I know a few people who loved them so much they re-read them. I’m so impressed. Maybe I should make this my personal challenge for 2015 – I have the set on my shelves! Thank you. I would love you to read them next year, they make for such a good reading project. I’ve been meaning to read them for years, so I shall give it a go. I’ll link in to your write-ups as I go. Eek! I’m not good at challlenges generally. Talking of re reading–could you do a feature on books people re read?By “people” i mean you and your followers/bloggers. I think I might have done that a couple of years ago. But it might be something I do again one day. Are you doing a month of re-reading this year, Ali? I love mine, but my TBR has EXPLODED so I might do February rather than January (also allowing me to do my first Trollope in January). I certainly won’t be doing a month maybe one book from my classic club list if any. Well the first Forsyte book would count as a re-read. So glad you got through the set and got so much enjoyment out of them! I’m glad this one reminded you of Message to the Planet – it shouted that at me when I was reading it and I wondered if it was only me (I know we discussed this when you’d just started reading it, but you had the idea in your head already). Yes very reminiscent of that book. So glad I read them all and it was good doing one a month. Yes, indeed – I rushed it a bit because Matthew got so over-excited and pushed through the audio books, and wish I’d taken it at one a month! Oh I can’t imagine having liked it as a teenager Powell isn’t always easy . Let me know what you think if yoi do revisit him. many thanks ali for posting epic event. feeling urge to start reading trollope or powell next yr…. of course could read both! do u have any recommendation ..if one or other is best to dive into first? Well I do like Trollope very much. But Powell is just right for a year long project. Why not start the Powells and give yourself two years to do the Trollope books. That way you can at least start them. brilliant Ali….yes…powell was wise to write 12, just right for annual project 🙂 and then start trollope….but which trollope to start??? I’d go for the Barchester chronicles. Happy reading.